Chris Chibnall says : â€œThe new Doctor is going to need new friends. 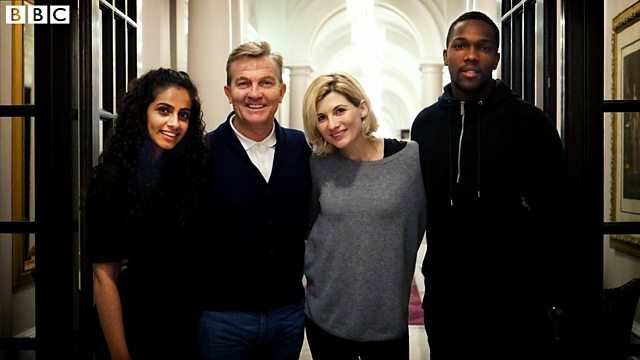 Weâ€™re thrilled to welcome Mandip, Tosin and Bradley to the Doctor Who family. Theyâ€™re three of Britainâ€™s brightest talents and we canâ€™t wait to see them dive into brand new adventures with Jodieâ€™s Doctor. Alongside them, weâ€™re delighted that Sharon D Clarke is also joining the show." WOOT! Glad that rumor was true about Bradley Walsh. Though, I do worry about how many companions there will be in the TARDIS. One of the problems with the Fifth Doctor's era that most fans agree on was that there were too many companions. 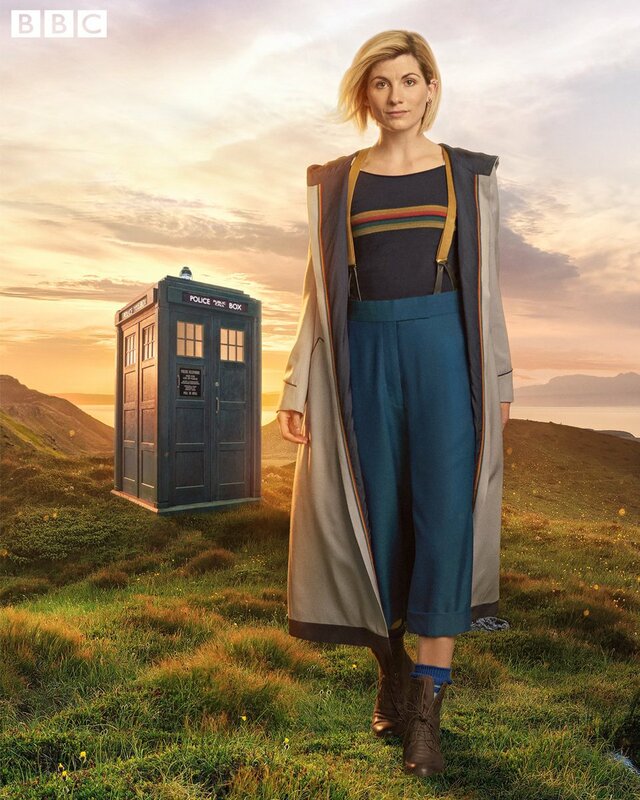 Fingers crossed that Chibnall can manage to make the companions' relationship with the Doctor something special despite the Doctor having to split her time between three people. Huh,I hadn't noticed that. Think that really is the inspiration? I dunno. 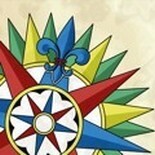 Maybe a mixture of that, with the color scheme on the shirt of Four's scarf? I got to say, I'm glad the first one never got made. It would turned the Doctor in a really disturbing creep. Ohmygod! Being a huge lover of Vicar of Dibley, I'd have loved this. ;) As a Yank, I haven't seen her much in anything else, but she's brilliant in that show. I love her initial reaction. I can't wait to see how this pans out. But yes, I liked her reaction, short as it was. Okay. While I know that there is much more to the TARDIS than her control room, it sure looks gutted to me by events. And if she is so badly damaged and without her Doctor, how the heck will they unite? I'm sure she'll end up landing on Earth somehow. During our stream of Twice Upon a Time, we did note the extreme sexism being displayed by One. And we agreed right then that it really didn't ring true with how the character was portrayed in those earliest days of Doctor Who. I found it very confusing. This item really helps to put my pov into perspective. Some people save the best for last. With his handling of the First Doctor, Steven Moffat may have done the exact opposite. Over his long run as showrunner, Steven Moffat has made many controversial decisions. Some, like introducing the War Doctor or bringing back Gallifrey, Iâ€™m at least ok with. Others, like bringing back Clara in Hell Bent, not so much. Usually, these choices can be described as â€œdivisiveâ€. They split fandoms down the middle, with some loving them, and others hating them.I can see what Moffat was doing. The sixties were a different time. People had different values. Sexism was a much bigger problem. Since the First Doctor was of that era, he wanted the audience to laugh at how different things were back then. Especially with the constantly horrified reactions of Twelve at his formerâ€™s selfâ€™s behavior. So whatâ€™s the problem? However, when he wrote Twice Upon a Time, he made one big choice that has left a lot of fans in agreement. Unfortunately, itâ€™s not for a good reason. It was his decision to include â€œhumorâ€ by making the First Doctor horrendously sexist. Short answer, itâ€™s because the First Doctor wasnâ€™t like that. Not even remotely. The First Doctor may have been written in the sixties. But he wasnâ€™t originally written with some of the worst values of the period. Hartnellâ€™s Doctor was a man who enjoyed exploring the universe and discovering something new. He was someone who understood that different civilizations had different values and customs. He would meet people throughout history, whether it was the past, the present or the future, and draw his own conclusions. Donâ€™t get me wrong, he wasnâ€™t a Doctor without flaws. Especially in the beginning, when he was very protective of his granddaughter. He didnâ€™t like his human companions, Ian and Barbara. Early on, he came close to throwing them off the TARDIS. But over time, he changed, and he learned to appreciate his companions. He learned what it is to be a hero. He became more open-minded and far kinder. By the end, he was the kind of man who knew not only how to tackle his enemies head on, but also, to finally give his companions the respect they deserve. So of course, when heâ€™s written by Moffat, heâ€™s telling women to clean the TARDIS and making comments on how the elderly can be â€œput to useâ€. Even worse than those examples, however? The worst moment in Twice Upon a Time has to be when he tells Bill that heâ€™s going to give her â€œa smacked bottomâ€ if she continues swearing. Now, Iâ€™m aware that the line was originally said to Susan in The Dalek Invasion of Earth. But, in that instance, she was his granddaughter. Itâ€™s still not OK behavior, and it is very dated. But itâ€™s about the worst thing One said in his entire run in terms of dated values. So of course, Moffat not only reuses the line, but finds a way of making it even worse! Suddenly, it goes from a poor example of dated family discipline to something far more sexist and cringing! It could be argued that One saying that line in the first place makes re-using it justified. In fact, that same argument could be made for his whole attitude in this episode. But imagine, 50 years from now, a writer decides to bring back Rose Tyler. Imagine that writer, casting a new actress, deciding to base their characterization of Rose Tyler on one single line. A line from the episode, Aliens of London. Which line? Now imagine a version of Rose Tyler making many crass and homophobic comments. Meanwhile, the new companion is trying hard to explain that she shouldnâ€™t be saying those things. And then, of course, the line from Aliens of London crops up, and itâ€™s a perfect justification for fans of why Rose would make those kind of remarks. This is exactly what Moffat has done to the First Doctor. Heâ€™s taken one single line, out of context, and based all the â€œhumorâ€ of Twice Upon a Time around it. Itâ€™s terribly insulting to Hartnellâ€™s Doctor, to say the least. Sometimes, after a regeneration, the Doctor goes through some mental trauma that causes him to act differently. The First Doctor could have been going through this during the regeneration itself. This is why heâ€™s acting so differently, because his mind and body are all over the place at this point. Do I believe this was Moffatâ€™s intention? No. Does it make sense? Again, if Iâ€™m honest, not completely. But itâ€™s the only in-universe explanation that even remotely fits. But even if it was Moffatâ€™s intention, itâ€™s still a bad story choice. Like in The Twin Dilemma, when the Sixth Doctor tried to strangled Peri, just because you can say the Doctor is going through mental trauma doesnâ€™t mean itâ€™s a good story choice. That moment still left a terrible first impression on viewers at the time. And that story actually mentioned that the Doctor was going through trauma due to the regeneration. Twice Upon a Time makes no such explanation with the First Doctor. As such, new viewers are easily lead to believe that this was exactly what the First Doctor was like. And thatâ€™s the biggest problem I have with the First Doctorâ€™s depiction. For a lot of fans, Twice Upon a Time will be their first exposure to the Doctorâ€™s original incarnation. At best, theyâ€™ll think his Doctor funny, in a cringing sort of way. At worst, theyâ€™ll want to skip him for the wrong reasons. As I mentioned before, the First Doctor wasnâ€™t perfect. Thatâ€™s why he was so great, because he got to grow and change over the years. But he was never quite as bad as depicted in Twice Upon a Time. Moffat has added flaws that not only werenâ€™t needed, but completely disrespect Hartnellâ€™s original performance and his legacy. Itâ€™s a shame, as David Bradley is a great First Doctor. As I mentioned in my review, there are occasional moments in Twice Upon a Time when heâ€™s written and performed exactly right. And overall, the rest of the episode was enjoyable, with some truly brilliant and moving moments. Itâ€™s just a shame that itâ€™s almost ruined by one of Moffatâ€™s last and biggest mistakes from his entire run on Doctor Who. Yeah, this was Moffat doing his typical screwing things up because he can do no wrong because he once wrote that really popular episode. George Lucas syndrome. "If you were my granddaughter I would threaten you with a smacked bottom. Did your parents not ever teach you any manners?" Far less cringy. Still, a bad portrayal of the first doctor and a real insult to William Hartnell. On the plus side, he's gone now. Fingers crossed for Chris Chibnall. Short version - she's going to use her natural Yorkshire accent. Weee! "When Gary Russell, Exec Producer at Planet 55 & Head Writer of PrisonerZero (Netflix) left for Australia his friends were asked to contribute to a surprise film. We may have gotten a tad overexcited..."